Microsoft has brought its BingItOn challenge to the UK to promote the use of its search engine by directly comparing results for searches to its largest competitor, Google. BingItOn is not a new thing, since Microsoft has been asking users in the US to put the search engine to the test since October last year. However, the company says its research suggests that Brits are a habitual bunch and that many of us (85 percent) have at least one habit, but that of those quizzed, 79 percent don’t know why they have it. As such, it’s taking aim not so much at converting people away from using Google, but more the sleepwalking searchers that have no particular affinity to a search engine. It says in recent blind tests, UK users preferred Bing 53 percent of the time, while Google was chosen 34 percent of the time. 13 percent couldn’t decide which they preferred. This figure looks at the broader numbers of how many people chose Bing overall according to the results at the end of the overall challenge. It’s interesting to note that the results differ a little when you look at the sum total of the number of times Bing was chosen as the preference at each step of the challenge. 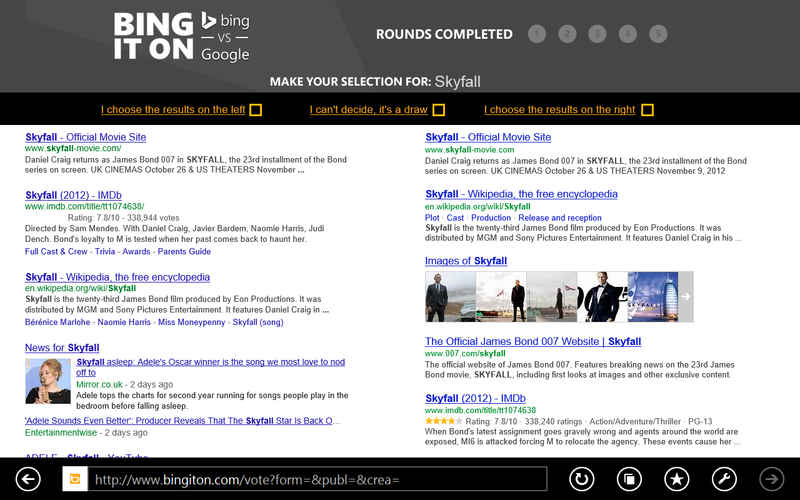 Bing just about still came out on top with 39 percent, versus Google’s 32 percent, and the undecided 29 percent. The test was made up of 10 search queries, while the BingItOn UK challenge is only made of up five searches. While Microsoft is pitching the BingItOn challenge in the UK as a tongue-in-cheek way to garner publicity for its search engine, it has come under fire about the methodology used for BingItOn challenges in recent times. No doubt the UK’s own version will throw up some interesting highlights on social media.